While not quite “fake news,” the headline tells less than the full story. 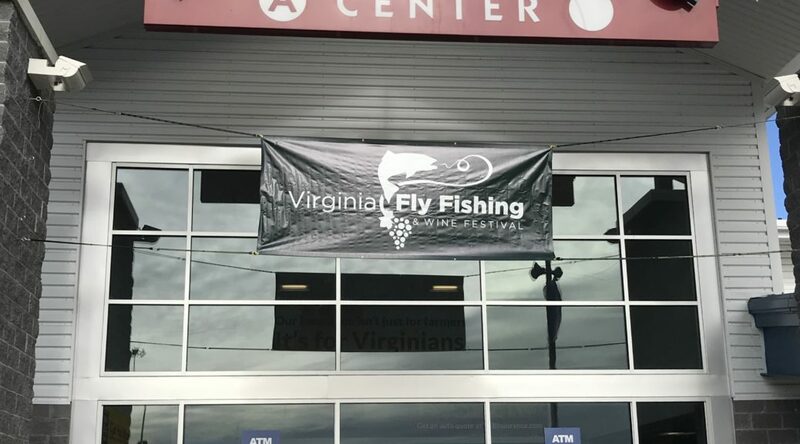 A couple weekends ago, my wife and I attended the 18th Annual Virginia Fly Fishing & Wine Festival. It was held at one of the buildings at the Virginia State Fairground’s site in Doswell, Virginia. It had, as they say, something for everyone. My wife, Karen, while not a fly-fishing person herself, does like a glass of wine every once and a while. She is also interested in learning about the various local wineries – both for what they produce and as possible destination points when we are hosting visitors. With this background information, I was surprised that Karen didn’t immediately ignore the fishing vendors and hit the wineries and tasting. That said, it was kind of early and Karen isn’t much of a breakfast wine drinker. With the tasting delayed, we had a very nice time walking around and talking with several of the vendors. 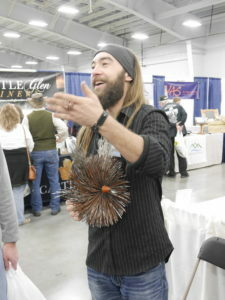 The show had a variety of vendor booths. 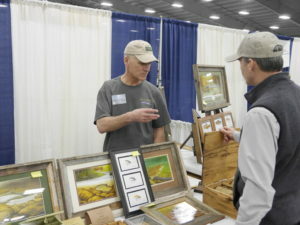 Several Virginia fly shops were at the show, as were different equipment vendors. 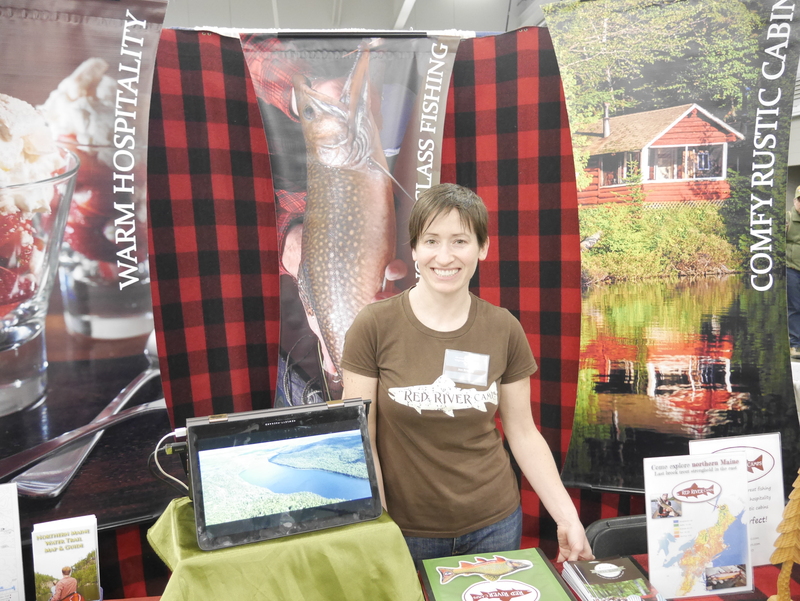 The State of Maine had someone there from its Department of Inland Fisheries and Wildlife and Jen Brophy from Red River Camps. Karen and I stopped to talk with the Mainers and to see if they knew Matt and Jess Libby from Libby Camps. 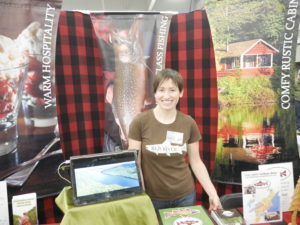 (Libby’s is where I am going this summer for a long-weekend fly-fishing trip.) 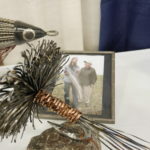 Being from Northern Maine, the representative from the Maine Department of Inland Fisheries and Wildlife and Jen Brophy both knew the Libbys. The conversation with these folks provided me with an opening to start working on Karen to try to convince her how much she’d enjoy spending time at one of these sportsmen camps, particularly Red River Camps – with its miles of hiking trails and canoeing opportunities. Karen wasn’t buying anything I was selling. She figured she could sit and read as well in Virginia as she could paying for the privilege in Northern Maine. She might have a point – she often does. I am still a lifetime away of interesting her in fly fishing. Maybe she’ll take it up when I become a yogi (yoga practitioner, not the bear). Of all the vendors two were most memorable. 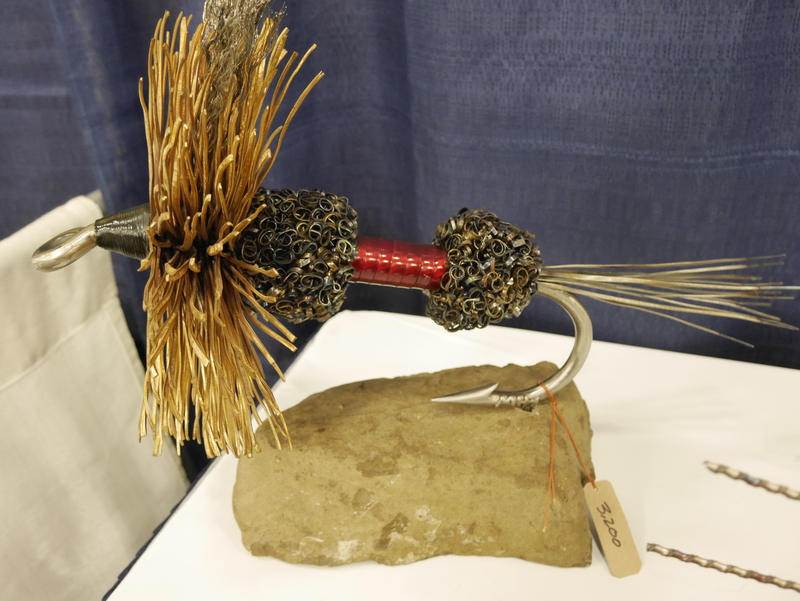 One of the most interesting vendor I encountered was a Matt Hart (“Harty”) who “tied” oversized metal flies as the artist/owner of The Forged Fly. These things were very unique and demonstrated real talent. The flies, while not inexpensive, were very reasonably priced for unique pieces of art. In fact, had I won the recent PowerBall for around half a billion dollars, I would not have hesitated to buy a couple pieces to decorate my newly purchased in-my-dreams fishing lodge. You should check out Harty’s unique talent and, if you happen to be family, one of these would make a heck of a Christmas present (even if there is no in-my-dreams fishing lodge to display it). Anther vendor that made a significant impression was D. P. Krupa, a one-man factory of fly-fishing art – all stuff he had drawn, wood-burned, and painted. He had framed paintings, mugs, glasses, wooden gift boxes with wood burned flies on the top and hand-decorated mugs inside. He spent some time talking about how long it took to just get the colors right on some of the ceramics. My understanding is that the colors come in powered form and they have to be mixed with water. However when the colors are fired in the kiln they change – for example, from purple to black. Through trial and error, he had to figure out which colors he needed to start with, so that after firing, he’d end up with the colors he wanted. 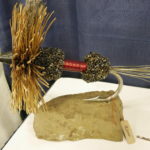 You can find D. P. Krupa Angling Art at http://www.krupaanglingart.com. He’d also be a great gift source for those you love in your life…be they forest rangers or forensic accountants. 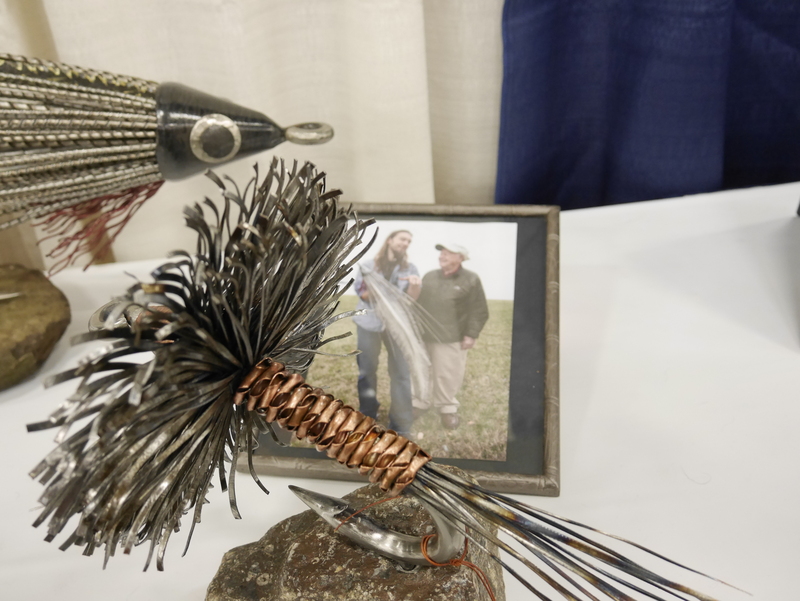 Along with the fly shop vendors, artists, and outfitters, the festival also had fly-tying demonstrations, casting demonstrations, kayak and Stand-Up-Paddle board demonstrations, and lectures. The one negative mark I would give the festival (although the food choices weren’t that extensive either) is that the venue for the lectures was inadequate. The lecture areas were curtained-off areas at one end of the cavernous facility. It was noisy and the festival had about half as many seats as were needed for the more popular talks. 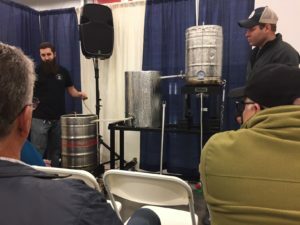 I have been to other outdoor shows, like the Vermont Yankee Sportsman’s Classic, and those facilities had separate large rooms set up for lectures. Space constraints and noise issues aside, the lecture topics were great. 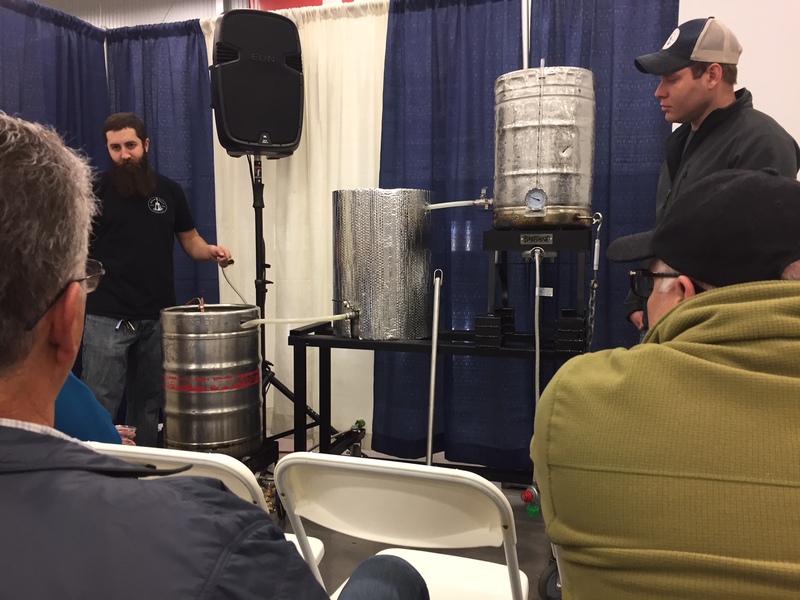 I went to “Fly Fishing the Shenandoah Valley” and “Trout Streams of the Shenandoah National Park.” Karen learned about the home brewing process by sitting in on “Micro-Brews 101,” presented by the brewmasters from Steam Bell Beer Works in Midlothian, Virginia. There was also wine … and since I didn’t take advantage of the “wine” part of the festival, I asked Karen for a brief summary of the vineyards and wines offered. The following paragraphs are from her. What a great way to meet a selection of unique Virginia wineries! There were eight scheduled to be in attendance: Narmada Winery, Caret Cellars, Horton Vineyards, Sassafras Shade Vineyards, Lake Anna Winery, James River Cellars, and Castle Glen Winery. The wine tastings were included with the festival entrance fee; before sipping and savoring, all you had to do was stop by the front desk and show your identification to receive your commemorative tasting glass. In addition to samples, each winery also had bottles for purchase. That was convenient if you fell in love with a particular wine, and a way to eliminate the problem of having to remember later which you’d enjoyed. I headed to the Horton Vineyards booth first because I had tried and liked their Norton dry red last year and looked forward to trying their other offerings. The Horton representative was very informative; in fact, she was on the schedule later to share her expertise at the food and wine pairings lecture. There was a lot of chatter and comparing notes among the samplers gathered at the table, which created a fun atmosphere. I tasted the Viognier (a spicy Rhone wine), Nebbiolo (a dry Italian red), Stonecastle White (a semi dry white), and Niagara (a sweet white). My last tasting at the Horton booth was the Rojo Xoco, a red dessert wine with chocolate essence – it was so rich and delicious, I decided to buy a bottle. My next stop was the sampling booth for James River Cellars located near Richmond, Virginia. James River offers a number of reds, whites, and dessert wines. Since reds are my preferred wines, I decided to sample their Rad Red – and loved it. This wine is a dry red with deep fruity flavors and smoky overtones; kind of pinot noir-ish to my (uneducated) palate. I made a mental note to pick Rad Red up in the future. Tasting the wines was a lot of fun and a learning experience for me. Since our move back to Virginia, I’ve been trying to increase my familiarity with all that Virginia has to offer for wine lovers. I’m disappointed I didn’t manage to get to more of the winery booths, which all seemed to enjoy a steady stream of visitors. The bottom line from my perspective? The wine tasting combined with the artisans’ booths and selected lectures just might be enough to *lure* me back to the Fly Fishing Festival next year!